Another lousy photo of the sun? 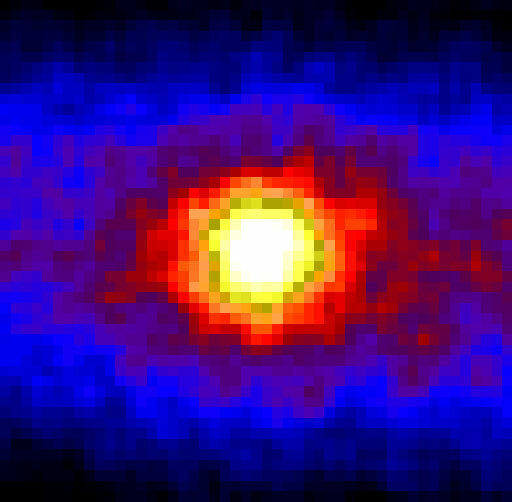 As a photo of the sun this doesn’t look very impressive – until you realise it was taken using neutrinos! And also that it was taken through the earth – when the sun was on the other side of the earth! An exposure of 503 day was used and neutrinos detected using a 50 000-ton water pool located 1 km underground. Neutrinos have an extremely weak interaction with other matter. Most of them pass through the earth without interaction and the detection relies on Cherenkov radiation emitted during a rare interaction with an electron in the water. Here’s a great graphic I picked up from Geekation. There’s a lot of information here. Click on the image to access the details – It’s worth it. This fascinates me as I remember the first Sputnik launch in 1957. All this has happened in my lifetime! It’s certainly changed our picture of the solar system. Thanks to: Where have we been? A very cool picture of where we have sent probes throughout the solar system. There’s been a few eclipses lately. Here’s some photos showing a different perspective of eclipses. This one was one of 1999 August 11 solar eclipse was one of the last ever taken from the Mir space station. The two bright spots that appear on the upper left are thought to be Jupiter and Saturn. Mir was deorbited in a controlled re-entry in 2001. With the retirement of NASA’s shuttle fleet later this year we won’t be seeing images like this any more. This shows Image of the solar transit of the International Space Station (ISS) and Space Shuttle Atlantis 50 minutes before docking last weekend. The last planned trip for Atlantis. Have a look at the full image or click on the photo – it’s worth it! The image is by Thierry Legault (see Solar Transit of ISS and Atlantis – Last Mission of Atlantis). Thanks to Bad Astonomer (see ISS, Shuttle transit the Sun!). Here’s an animation showing the accumulation of debris in near earth orbit due to human activity since 1957. It does look very cluttered but remember the articles aren’t to scale. YouTube – Space debris over time. 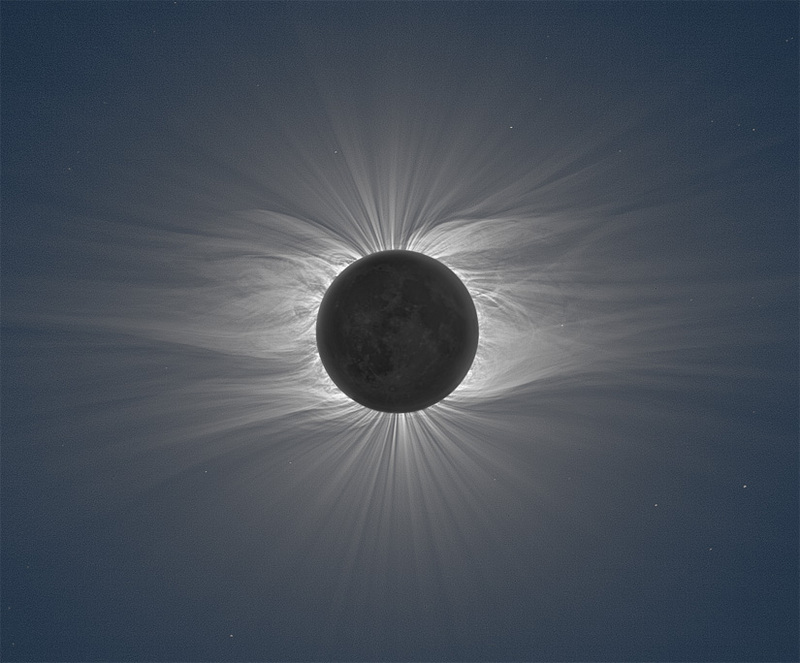 This photograph of the sun’s corona is a real beauty. it was captured by Miloslav Druckmüller and colleagues from Brno University of Technology, Czech Republic, during an eclipse on July 22, 2009. They were located on Enewetak Atoll in the Marshall Islands. For further image details, equipment used and a spectacular high-resolution photograph, visit Miloslav Druckmüller’s eclipse webpage. Although the sun’s atmosphere is many times hotter than the sun itself, it is also many times thinner. As a result, it produces very little light and it can only be observed if the glare of the sun is blocked out. In this fantastically detailed photograph, the moon has covered the disk of the sun from sight, allowing the solar corona to glow. “3D Sun” lets you carry a virtual window onto today’s sun, right in your pocket. Open this app anytime to see what’s happening today on the sun’s ever-changing surface. See when major solar flares erupt on the sun’s surface. Track sunspots that reveal the churning activity inside the sun’s fiery inferno. 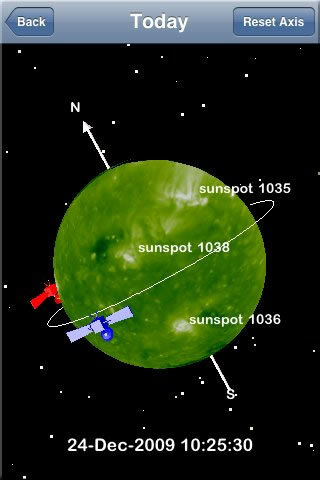 News alerts ­ provided by a Ph.D. trained astrophysicist ­ inform you of important solar events. Optional push notifications will alert you of the most important events even when “3D Sun” is not running. Some religious apologists just can’t leave Galileo alone. They are unhappy about the fact that most people accept that the Church behaved badly in sentencing Galileo for heresy. (He got house arrest for the rest of his life and bans on his books, one of which was suppressed for 200 years). So in a manner which reminds me of modern day Stalinists trying to make excuses for the Stalin Terror, or to claim it wasn’t as bad as people believe, the apologists have been busy rewriting the history of the Galileo affair. For example, they promote a document describing Galileo’s “imprisonment for his heretical ideas of a heliocentric solar sytem” as a myth! (see On the crushing of historical fables about religion, science and culture and Mythbusting: Historical fables about Christianity and Science).